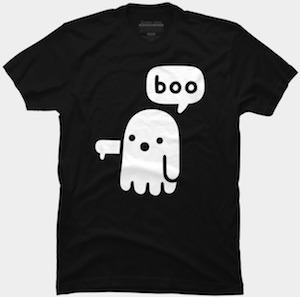 This t-shirt simply shows a yellow ghost saying “boo”. You can get this ghostly t-shirt in styles for men, women, and kids and it is available in many fun colors and sizes for the whole family. 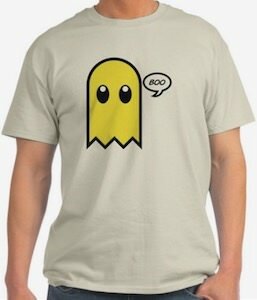 As you can see there is just a yellow ghost on the t-shirt and this ghost looks a lot like the one in the Pac-Man video game but this one says “BOO” to scare you. You may not be to scared off this yellow ghost but you have to admit that it saying “BOO” is pretty scary. 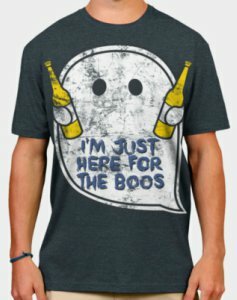 Are you looking for a simple fun t-shirt for Halloween or any occasion that will let everybody know that you and a ghost is here to party. On the front of this t-shirt you will see a large image of a white ghost that has black eyes and two little hands that are each holding a bottle of beer. Also in the ghost is the saying of “I’m Just Here For The Boos”. Available in a wide selection of men’s sizes that range from Small to 2XL and you get a choice between 10 fun, cool and vibrant colors and the shirt is made from 100% cotton that will be super super comfortable and soft to wear aswell as very durable to last a long time for any occasions. If you are looking for a funny but scary Halloween t-shirt then this women’s shirt is perfect. The white shirt has colored edges around the sleeves and neckline and you can pick from black, green, red, pink and more. 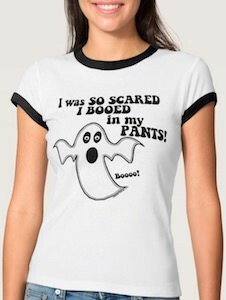 On the t-shirt you can see a real scary ghost that says “BOOOO!” and then above the ghost you find the funny text “I was so scared I Booed in my pants!”. You have to admit it’s fun and perfect to wear around Halloween because we then we can all have a laugh about his fun looking t-shirt. And you can get this booing t-shirt in women’s sizes Small – 2XL. 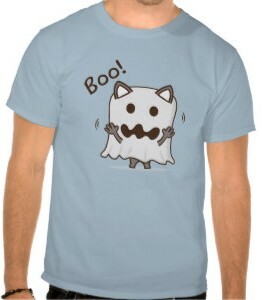 So get ready for Halloween with this I Booed In My Pants Scary Ghost T-Shirt. Many people are afraid of ghosts but what do you think ghosts are? 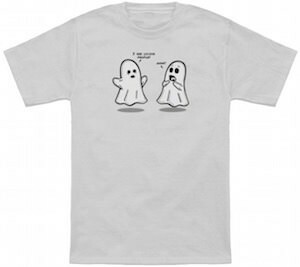 On this t-shirt you can see two sheet like ghosts talking about when they see humans and they seem to be just a scared as we are of seeing them. So yes this t-shirt is great for you to wear and tell the ghosts not to worry and it also makes a great shirt for Halloween. You can get this t-shirt in a silver grey color in a men and women’s version in sizes Small – 2XL. Don’t start hunting for ghosts because this t-shirt tells you they are afraid of humans. Tell the world what you know by wearing Ghost I See Living People T-Shirt. Everybody remebers the classic video game Pac-Man and everyone loves halloween, so let’s combine the classic video game Pac-Man with halloween, what can the outcome possibly be? 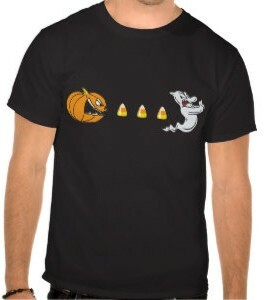 Well here it is a very fun t-shirt that has an image on the front of a jack-o-lantern looking like Pac-Man chasing a line of candy corn and a ghost. Made from 100% cotton this will be very comfortable and durable, it is available in a huge variety of sizes ranging from S to 6XL, and check out the 24 different colors you can get this t-shirt in. Have some classic fun with the Jack Man Halloween T-Shirt. Let’s get this Halloween party started. This is a t-shirt that can be worn all year long, you don’t have to save it for October only. Ghosts can be very scary, but not this one. This one is cute as can be. A cat has cut the appropriate holes in his white sheet to make himself look like a scary ghost. Boo! He will get you, but I think none of us will mind. The t-shirt comes in S to 3XL, is 100% pre-shrunk cotton and comes in many different colors for the background of your t-shirt. Get it right “Meow”, the Halloween Cute Kitty Ghost T-Shirt. In the 1950’s movie posters were great art pieces to depict the upcoming show. They were full of color and stand out fonts, that even people today collect and cherish these fabulous pieces of history and memorabilia. This t-shirt embraces those posters with its own take on a Halloween Ghost Show. With orange, green and white to set the stage of Halloween night, you will find ghosts and pumpkins and nightly creatures to tell you about the movie features to come. The t-shirt comes in a full size run from S to 6XL and comes in many different colors to choose from for your t-shirt. Colors like brown and Texas Orange would make great color combinations. It is also made from 100% pre-shrunk cotton. 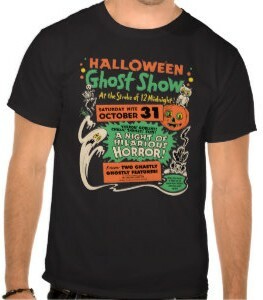 Spook yourself with delight with the 1950 Halloween Ghost Show T-Shirt. A t-shirt that you can wear every day of the year is a great buy. Why not get a t-shirt that is playful and simple to everyone who sees your little ghosts hanging on to their letters B-O-O. 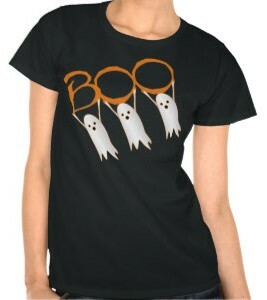 This women’s t-shirt has simply 3 white little ghosts hanging on to the orange letters that spell BOO. That’s all that is needed on this t-shirt. There are a number of colors to choose from for this t-shirt. It comes in sizes S to 3XL. All sizes to fit anyone that wants to put a little scare in their day. It’s now or never, get the Ghostly Boo Halloween T-Shirt.